Somehow, and I am not complaining, Martin Davidson's noted English label Emanem has been releasing the work of Minnesota's free-improvisation master Milo Fine. There has been a Milo Fine Free Jazz Ensemble release with guitarist Steve Gnitka and other MN cohorts. A CD each of duets with Anthony Braxton and Derek Bailey, both records as wonderful as you would expect them to be. There has even been a double CD set of Fine's work as a pianist, solo and in a trio which I have not yet heard, but I think I need to. The reason I chose to feature this release is here Fine plays with a number of noted English free improvisation musicians whose work I am aware of from record reviews, but I have never gotten around to exploring their work in detail, save for an appearance here and there. There are just only so many hours in the day. Over four days in a month-long visit to England, Fine plays with some twelve musicians, ranging from octet to duo with Simon Fell, Philipp Wachsmann (whom I only know from the Evan Parker Electro-Acoustic Ensemble), Charlotte Hug, Hugh Davies and others. 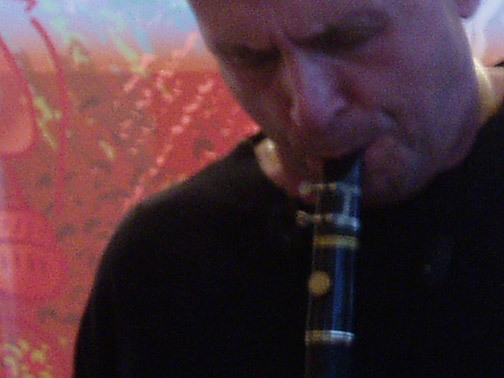 The playing of these groups is top notch, some loud raucous parts, and also some quiet parts, extended techniques mixed with more conventional playing. For example, during one of the longest tracks, “May Radicals Minus One” (a quintet), Fine takes to the piano, proving some slow, beautiful chords, slowing the pace down, the viola, cello and bass adding little accents of noises. Three duos with clarinetist Alex Ward were the first pieces I played. Two duos with Fine on clarinet are fast flurries of notes, squeaks and tongue-slaps. On the third duo, Fine plays drums, keeping up a similar fast pace. Wonderful playing throughout.